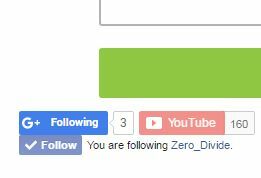 As you may have noticed zero-divide.net website where I post all the updates, research and news have gotten a bunch on new social sharing buttons. I would like to encourage all our friends to share our web pages with the big wide net! As I am beginning to realize the potential behind the whole "social networking" thing, I also understand that this is something I should have done from the get-go. Help this project flourish by recommending our great software and information to your peers on the Facebook, Google+ and LinkedIn!